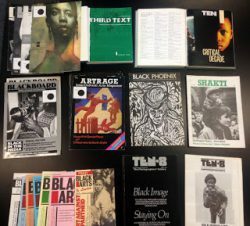 Drawing on the unique holdings of Iniva’s Stuart Hall Library, new collective, Patchwork Archivists, and curator and writer, Adelaide Bannerman, were in conversation to discuss the importance and contemporary relevance of these magazines held by the Stuart Hall Library. Last year’s DIY Cultures workshop consisted of Joy Gregory (artist) and David A. Bailey (artist, writer and curator) in conversation with Nick Brown (Librarian at the Stuart Hall Library, Iniva). The conversation introduced some of these key publications and attempted to critically situate them. Produced during a time of cuts in public services and welfare, increasing social division and a dominant narrative in the popular press of racism and xenophobia the current importance of these magazines might be as a tool to help inform an emergent generation of cultural activists now facing an intensification of these same issues. Adelaide Bannerman is a freelance curator and writer based in London. Her research interests are focused on highlighting the performative gestures and responses in live and visual performance art, referencing individual and group autonomous art practices. Priya Jay is a writer and visual culture researcher. Her current work focuses on collective memory, mourning and historicity within the postcolonial archive, using family photography to tell a people’s history. A’Ishah Waheed has an interest in oral histories, storytelling, inter-generational and decolonial archiving. Farha Bi is interested in storytelling and arts as a vessel for creating social change. She is an arts practitioner, using drama and film-making to explore issues affecting marginalised groups.